*Serving time only... we go home when you go home ~ we are happy to stay! any event (large or small) you have in mind, and parties are what we do best! 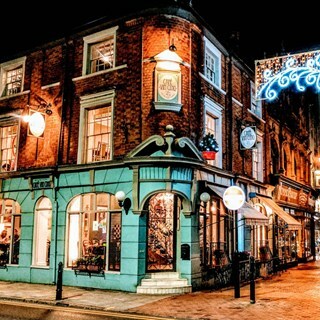 Multi-award winning restaurant and cocktail bar ~ Officially voted The Best in Warwickshire. 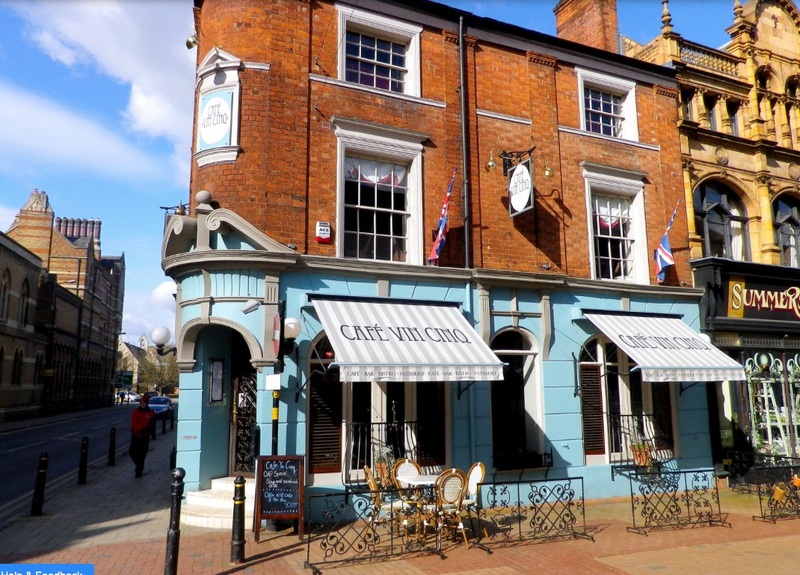 Located in the heart of Rugby town, brushing shoulders with, and overlooking, the historic Rugby School; Café Vin Cinq offers its guests an unparalleled dining experience, both in terms of exceptional food and exemplary service. Situated in an elegant and unique piece of architectural history, Café Vin Cinq is set on 3 floors, and at its centre, an exquisite spiral staircase leading to all floors. The boutique style restaurant is delicately illuminated with spectacular antique chandeliers and is an ideal stage for romance, family and/or any type of social get-together. Whether you are a sole guest, just looking for a bite to eat, or you have have a truly special reason to celebrate, Café Vin Cinq is the place to be. Even though the restaurant is a little sanctuary of Parisian heaven, we have an informal, relaxed and charm-filled demeanour, and invite all our guests to join us, to be spoiled with flawless food and by bright, vivacious, caring staff, who's only raison d'être is to ensure your happiness. Call us whenever the fancy takes you... we can't wait to say 'hello'. Brilliant evening our first time here.staff were very warm and welcoming nothing was to much trouble. The food was cooked to perfection and the desserts wow loved the whole experience. Food had room for improvement,  tasty but dry and fish slightly overcooked. Not enough 'non- existent' crab in the linguine. Fantastic food.. great ambience, warm service and a lovely host! lovely atmosphere for that special occasion. Food outstanding and staff excellent. Would highly recommend it if you want a really special meal. It was great as usual. Had the cod and pork belly between us. Both dishes were very tasty. Another great evening! You never let us down and thanks to everyone who made the birthday evening very special . 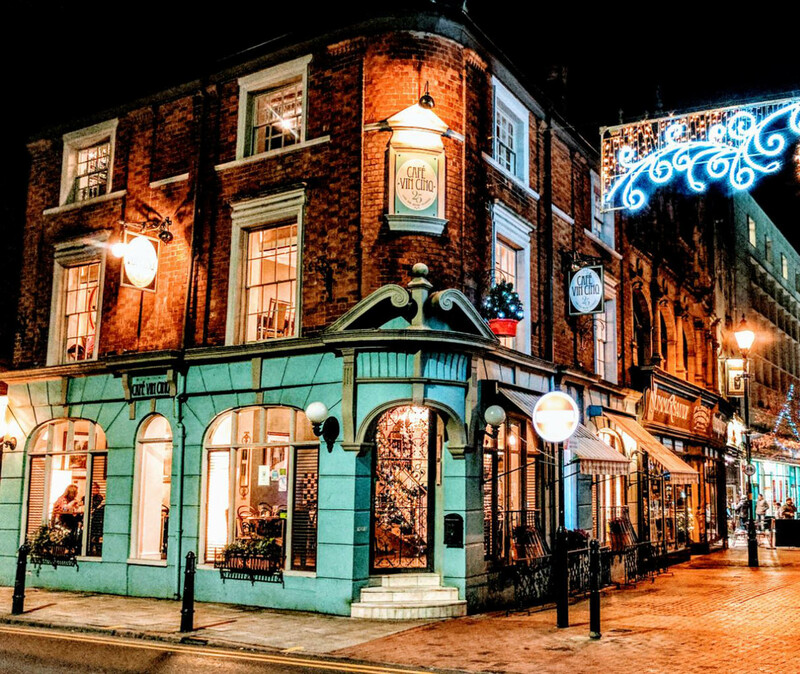 Had an absolutely fabulous evening here on Friday night the atmosphere was wonderful all of the staff were very friendly and chatty the food as always was amazing we will be back again . We had a lovely evening celebrating our first wedding anniversary, thank you very much. The service was fantastic and the food incredible as always! A really lovely evening. The food was excellent, and when we mentioned it was our wedding anniversary we were brought two complimentary glasses of Prosecco. Lovely atmosphere and the service was excellent. Very pleasant evening celebrating an 18th birthday. It was our first visit however friends recommended the chateau briand very highly and it completely lived up to the hype. Unfortunately we were too full for any desert! Lovely atmosphere, very accommodating staff. Lovely food, good wine, although the very nice white actually needed to be less chilled. Would highly recommend. Always a fantastic experience dining at Cafe Vin Cinq. Staff are friendly and attentive without being annoying. I’d love to know where the Covent Garden painting has gone from above the fireplace on the ground floor! Had my eye on that for years and was upset to see it had gone  haha. Lovely meal can,t fault the food .the only problem is myself and my husband were on a table between large party groups who were very noisy .although that’s not the restaurant fault.the service was very good .lovely place .the cocktails upstairs are worth a try gorgeous. Amazing food, Lovely friendly staff. Beautiful restaurant. I had a wonderful night and will certainly be back. Thank you. We went to celebrate a friend’s birthday, then this week, our wedding anniversary! Last time we commented that a specific dish was missing from the menu and there and then the manager promised to do her best to make it available for our next visit. Lo, it was so. That’s amazing service. Every time we go we get a wonderful welcome from the staff, the food is marvellous and good value for such high quality. I thoroughly recommend CaféVinCinq to everyone’s attention. Food  drinks service was all excellent.